Wait. Before you burn my mom card or tell me that I must be a horrible parent to not want children around or something, allow me to elaborate. We take Norton out to dinner on a regular basis. We’ve gone to chain restaurants like Denny’s and White Spot that have a lot of kid friendly cuisine. We’ve gone to sushi restaurants, family friendly sports bar restaurants, and a fondue house. Among other places. Norton is not a perfect child. He can get rambunctious. He can refuse to listen. He can be difficult. Here’s the thing, though: if he gets too difficult and we can’t get him back under control, we leave. The biggest issue is that I tend to worry too much and have a very low threshold for “too rambunctious.” In fact, when we were out for sushi at a very tiny restaurant, the family at the next table told me not to worry about it because he wasn’t being all that out there. This was said after I apologized to them and started getting Norton ready to go. Turns out that they were right; in a couple of minutes, Norton was happy eating some chicken teriyaki. I still spent the rest of the night watching and ready to basically grab my kid and run. On the opposite end of the spectrum, there are the children that I’ve heard about from servers. The kids wander about while their parents ignore them. They’ve wandered into the kitchen or caused a server to get hurt while trying to avoid dumping hot food on the kids’ heads. When the children are returned, there are parents who have the gall to scream at the servers for this… as if the servers are supposed to not only bring out their food and beverages while making sure their dining needs are met, but are supposed to be the baby-sitters, too. For the record, I don’t think that the children are the problem in most of these instances. It’s the parents not being parents. I certainly understand that children can be difficult, even when they are being normal. I’ve had my own meltdowns over it. As for the restaurants themselves… as long as they are not denying someone service based on race, creed, or religion, and as long as they are honoring the terms and conditions of the Americans with Disabilities Act (or the Canadian equivalent), then that’s up to them. If you don’t like it, make it clear that you don’t appreciate it and vote with your dollars. You know, the same way you do when a company has political or social policies that you don’t agree with. What do you think? Would you eat at a restaurant with a child ban? 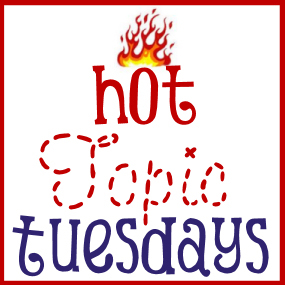 Next week’s Hot Topic Tuesday: When is breastfeeding going on too long? I agree. There are restaurants for children, and there are restaurants not for children. As private businesses, restaurants can say no to children under certain ages. Parents who have a problem with these policies can take their business elsewhere. In a perfect world, children would behave perfectly and when they didn’t all parents would know when they were in a place where a rampaging toddler wasn’t appropriate and remove them from the situation. Alas, the world is not perfect. I consider myself a considerate restaurant patron. Like you, I often take my daughter to family-friendly places. I make sure she’s not overtired when we get there, bring toys to keep her amused while we wait for dinner and have on one occasion chucked her over my shoulder and gotten our meal packed up to go. So on the (VERY) rare occasions that my husband and I are out at a restaurant, late in the evening, after getting a sitter for own child because the place we’re going to is decidedly NOT kid-friendly, I am more than a little annoyed when someone else’s loud, tired bored child disrupts my dinner. Is it the child’s fault? Absolutely not! But in those situations, and it has happened a few times, I find myself pretty supportive of the kid-free restaurant. I stumbled across this site through searching for childfree or age restricted restaurants and I must say; it’s refreshing to see parents aware that not everyone enjoys dining experiences which include children. My wife and I are and will remain childfree so we do not relate or have the same tolerance of children that others do. We have been to many restaurants where children are screaming, running around, knocking stuff over etc… and I feel as though my dinning experience was totally ruined. We do not frequent establishments that are obviously geared towards families because we want to be able to have a quiet conversation without all the commotion that often happens in family friendly establishments. Our choices are very limited because we’re not attracted to the bar scene and we’re not of unlimited budget that we can afford the high class establishments on a frequent basis so we’re kind of up a creek without a paddle. It’s nice being able to have an adult conversation (not talking about foul language either) without having to fear tiny ears overhearing subjects that they probably shouldn’t be hearing. There should be establishments where adults can go that aren’t ‘watering holes’ because even the patrons of those establishments can be just as obnoxiousness as crying/screaming babies. So it’s not just about how well disciplined or behaved a child is or isn’t. You are so right that the children are rarely the problem. The larger issue is parents who fail to address bad behavior.